New York (CNN) — Asked which school meals were their favorites, students at a public school in the New York borough of Queens don’t say chicken fingers or meatballs. Instead, they name rice and kidney beans, black bean quesadillas or tofu with Chinese noodles. “Whoever thought they would hear a third-grader saying that they liked tofu and Chinese noodles?” asked Dennis Walcott, New York City schools chancellor. “We decided on a vision where health and nutrition would be a part of educating the whole child,” school principal Bob Groff said. People tell me all the time that they would love to go vegan but just can’t give up the cheese. It is literally addictive and a very hard habit to break. (Google the words “cheese addictive as heroin?” if you want to know why giving it up is such a struggle.) But of all the animal-based foods, cheese is the WORST for your body! It is loaded with fat and cholesterol and calories. Just giving up cheese will make a huge impact on your weight and your health. When I went from vegetarian to vegan I realized I PUT CHEESE ON EVERYTHING! It took me a full year to fully change my palate and get off the cheese. My secret? I developed a super awesome stand-in for cheese so that I could veganize all my favorite, traditional recipes and eat them, guilt-free. Basically, when I went vegan I thought about what cheese gives to a dish and how I could transform my cooking so that I wouldn’t feel deprived. I do not like the way cheese substitutes taste and they are not whole foods. Traditionally we use cheese in a dish to add richness and flavor. I realized that to be a successful vegan I would have to find another way to add that savory, warm, gooey richness to my dishes or I’d feel deprived and give up. The following recipe is my solution. It is pivotal to many recipes in my cooking repertoire, especially since I cook for kids, who really want traditional dishes. Here’s how I do it: every couple of weeks I make a double batch of this sauce. 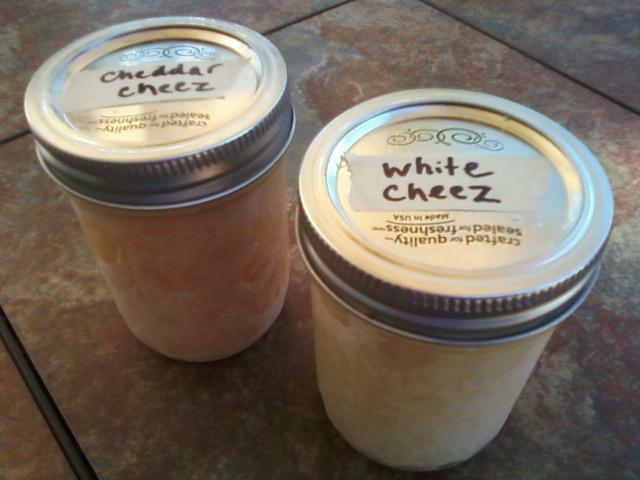 I pour out half of it into two 8 oz jelly jars and label it as “White Cheez.” I add the additional ingredients to the remainder while still in the blender to make the rest into “Cheddar Cheez” and then pour that into jelly jars. A double recipe will make 5 jelly jars so I usually use one serving for a meal I’m making that night and freeze 2 white cheez and 2 cheddar cheez. 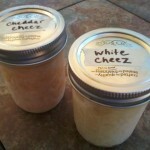 VERY IMPORTANT NOTE: Do NOT cook the cheez before putting in the jars. It will separate in a weird way. Put it in the freezer uncooked and then thaw and cook/thicken when you are ready to eat it. With this recipe in hand you have at your finger tips a ton of yummy, traditional recipes like pizza, lasagna, eggplant parmesan, Philly cheez steak sandwiches, nachos, quesadillas, mac and cheez, casseroles, grilled cheese, burritos and more. I’ve listed the basics of some uses for the cheez sauces below but I’m sure you can come up with a bunch. Use it anywhere you would melted cheese. With this sauce in hand you can adapt and transform all of your favorite non-vegan dishes into healthy, vegan yumminess! Pour all ingredients into a blender and blend on high for a couple of minutes until everything is very smooth. Pour into a pot and cook on medium, stirring frequently with a whisk until it reaches the consistency of custard. Use a spatula to scrape the sides while cooking to make sure it’s evenly thickening. What to do with it…. Pizza: roll out dough, spread with tomato sauce, pour 1 ½ c *hot* cheez sauce. Pour immediately after cooking. Do not wait or it will not pour evenly! Don’t pour too thick. It’s ok if it’s not completely covering the tomato sauce. Top with your choice of toppings and vegan Parmesan (recipe is on this site. See “Ratatouille” recipe). Bake as you would for traditional pizza. Eggplant Parmesan: Layer marinara sauce, breaded eggplant, sauce, cheez and again for two layers. Top with sauce, cheez and vegan Parmesan. Bake until heated and bubbling. Lasagne: Make as you would traditional lasagna. Substitute tofu ricotta and use white cheez for mozzarella. Mac and Cheez: Use 1 jar of sauce for 2-3 people. Boil about 1 ½ to 2 c dry macaroni. Add ½ c thawed peas or 1 c steamed broccoli at the end. Cheezy Broccoli: pour cooked cheez on steamed broccoli. Serve over baked potato or rice for a main dish. Nachos: Pour over tortilla chips with black beans. Top with lettuce, salsa, avocado, olives, and vegan sour cream. Burritos: Fill a flour tortilla with rice, whole or refried beans, a line a cooked cheez, lettuce, salsa and whatever else you like. Roll up. Cheezy Bean Dip: Mix together equal parts cheez, pureed beans and salsa. Heat and serve warm with tortilla chips. For Grilled Cheez: when you have leftover cheddar cheez, refrigerate. Spread the chilled, thick cheez sauce on bread. Cook in skillet with a little cooking spray until bread is toasted and cheez is melted. For Quesadillas, spread chilled cheez on flour tortilla with beans pureed with salsa. For Panini’s I use leftover white cheez (usually leftover from making pizza) and cook the sandwiches on the George Forman grill. I add spinach, roasted red pepper or tomatoes and sautéed sliced red onion or mushrooms. Why your average 24-year-old guy thinks going vegan is a no-brainer. Hindsight may be 20-20, but my foresight is foggy at best. Should I have voted for that guy? Was that shirt worth 40 bucks? Maybe I should have made that dentist appointment a month ago. When it comes to my dinner plate though, whether it’s filled with kale salad or a seitan-chicken shwarma, my decision to indulge in a plant-based diet comes only with conviction. With each health study, news report, opinion poll, and lunch break, my vegan certitude strengthens. Here are my top five reasons why I’m glad to be cruelty-free today.